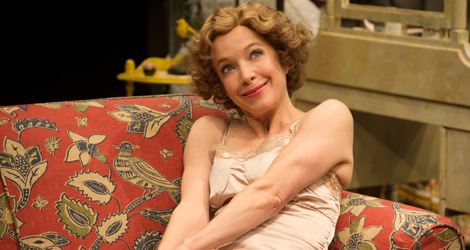 This season the lunchtime show at the Shaw Festival is a rarity by Tennessee Williams. Williams is so well known for his full-length plays that people tend to forget that he was attracted to the one-act play throughout his career and wrote more than 70 of them between 1930 and 1983. One of these is A Lovely Sunday for Creve Coeur, first performed in its final version in 1979. Though written in the 1970s, the play is set in the 1930s in an “efficiency” apartment in St. Louis, Missouri. It is an absolute gem of a play, so full of detail and resonance that it is more satisfying in itself than many full-length plays. The Festival gives it an insightfully directed, beautifully acted production that will give you a fascinating glimpse into the gentler side of Williams’ character. 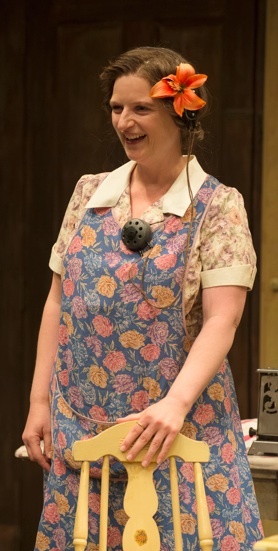 The play concerns two roommates – Dorothea, known as “Dotty”, (Deborah Hay), a still-pretty middle-aged teacher of civics at the local high school, and Bodey, a frumpy kind-hearted woman of German heritage whom Dottie finds too domineering. What particularly irks Dotty is how Bodey keeps trying to match her up with her twin brother Buddy, a nice but overweight, cigar-smoking man with a good job in a brewery. This particular Sunday is one such occasion where Bodey is preparing a large picnic for her, Dotty and Buddy to enjoy at Creve Coeur Park, a short trolley ride from where they live. Dotty is not at all attracted to Buddy and tells this to Bodey outright. Dotty says that she couldn’t live without romance and romance is exactly what she thinks she’s found in a relationship she has with the school principal, T. Ralph Ellis, whose phone call she is anxiously awaiting. Dotty thinks that fact that she let Ralph go all the way with her on the reclining seat of his new car is a sign that he intends to marry her. Anyone else, however, like Bodey, who has read the Sunday St. Louis Post-Dispatch, knows something about Ralph that will destroy all Dotty’s illusions about him. Bodey has removed the item from the paper and intends to tell Dotty about it during the picnic when they will all be in a calm, beautiful setting. disdainful of everything to do with Dotty’s present apartment including Bodey. Things get even worse when it appears that Miss Gluck (Julain Molnar), a seemingly mad German-speaking woman from upstairs is welcome in Dotty’s apartment anytime. The tone of the majority of the play is highly comic. Dotty’s attempt at a genteel description of her romantic evening with Ralph and her satire of Bodey’s brother’s deficiencies are very funny. So too is the duel of put-downs between the haughty Helena and the hard-of-hearing but eagle-eyed Bodey. Yet, under all the humour there is the increasing tension of when and how Dotty will learn the bad news about Ralph, whatever it is, and how she will take it. Director Blair Williams has beautifully balanced the surface humour with the underlying tension so that even as we laugh we become increasingly anxious about the revelation to come. Williams has clear insight into all four characters, but most notably Bodey. At first we side with Dotty against Bodey’s prying questions about Dotty’s personal life and her attempts to make a match in which Dotty has no interest. But gradually both Williams the author and Williams the director make us see that Bodey truly wants the best for Dotty. Bodey has given up hope for herself. The awkwardly obvious 1930s style hearing aid Bodey has to wear lets us know she feels embarrassed about her appearance. Dotty’s help with choosing the right flower for Bodey to wear in her hair to hide it shows that Dotty deep down also cares for Bodey. While Dotty’s overexcitable condition makes her unable to deal well with the severely depressed Miss Gluck, the clearest sign of Bodey’s inherent selflessness is how willing she is to help Miss Gluck, a middle-aged woman who can’t cope with the recent death of her mother. One of the main reasons Bodey would like Dotty to marry her brother is so Dotty would have benefit of a good, stable man and would have the children that Bodey knows she herself will never have. Blair Williams makes us feel that Dotty and Bodey regard each other more as sisters than mere roommates and that Helena’s intervention is so jarring because it feels like Helena is trying to break up a family. Deborah Hay wonderfully radiates Dotty’s new-found joy as well as the naïveté that surrounds it. Her greatest moment is when Dotty finally learns the truth about Ralph and sees all the illusions about herself and her future life crumble before her. Yet Hay has given Dotty enough inner strength that we positively feel like cheering when she manages to pull herself back together through a sheer effort of will to face the day. Kate Hennig gives a delightfully warm performance as Bodey showing us an ordinary woman’s complex mixture of virtues and flaws, pride and embarrassment. Hennig shows that Bodey can be fierce when defending Dotty or herself when provoked by the likes of Helena, but that deep down Bodey has no high opinion of herself and only blooms when she has people round her she can either trust or help. Kaylee Harwood makes us dislike Helena right from the start with a precious demeanour and upper-class tone that reveal how pleased she is with herself and how displeased she is with everyone else. Julain Molnar’s Miss Gluck represents the intrusion of tragedy into the action’s otherwise cheerful depiction of preparations for the picnic. Molnar speaks credible German with so much feeling that even those who don’t know the language will intuit what her character is saying. Designer Cameron Porteous has cleverly devised a way to represent three rooms simultaneously on the small Court House stage in what must be the most jam-packed set that theatre has seen. Blair Williams’ sensitive direction skillfully negotiates the transition in tone from humour to poignancy. He makes us realize that that all four women, even the unlikeable Helena, are lonely in different ways. What is so heartwarming is how Williams the director and Williams the author lead the other three women to recognize this loneliness in each other. Fans of Tennessee Williams will relish the chance to see this undeservedly obscure play in such a fine production. Theatre-lovers in general should add this play to their list of what to see this summer. Even though it’s only 55 minutes long, it’s the kind of play that makes you feel you’ve had a share in a lifetime of experience. Photos: (from top) Deborah hay as Dotty; Kate Hennig as Bodey. © 2014 David Cooper.